We’ve said it before, and we’ll say it again; our roads have become far too gloomy and serious. Parking lots are filled with a kind of grayscale sadness thanks to the prevalence of white, black and silver paint on cars. Bright colors are rare, and non-metallic pastels? Forget about it. That’s sad, because this lilac car is the most perfect 911 Turbo I’ve ever seen. This is a 930-generation 911 Turbo. It’s a car that was so infamous for snap-oversteer that it earned the name “widowmaker,” yet in this cheerful Easter Egg-worthy pastel purple, it can do no wrong. It’s cute. Approachable. Charming! You cannot stay frustrated with a lilac car, even if it’s a rare old 911 that absolutely wants to spin out all the time. It radiates lavender happiness right back onto your face. Case in point: I have raced two aircooled Volkswagens, both powered by tired, oil-splattery Type 4 engines. One was lilac, and the other was silver. While the lilac car ran better, it also had a tendency to lay a smokescreen behind it when it was full of oil. Yet I was more forgiving of the lilac car’s problems. I couldn’t stay mad at it. It was too cute. Meanwhile, there’s a dent in my silver car that got a little deeper when I got frustrated and kicked it. Perhaps it is time for a more soothing repaint...and new carbs. Probably new carbs. This 1979 911 Turbo in particular is especially rare. 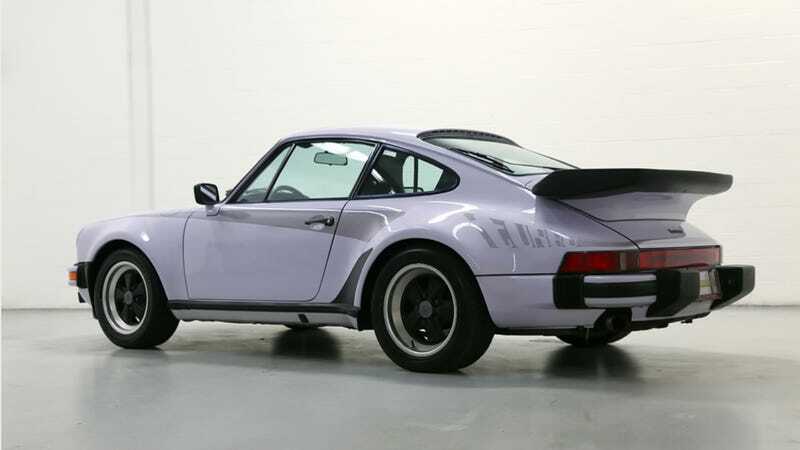 While Porsche will paint their cars almost any color you wish, there weren’t a lot of orders for Lilac paint with a Moonstone “turbo” stripe. It’s a one-owner example with gorgeous brown leather interior and only 41,877 miles on the odometer. Seller Sloan Cars claims that the paint is 90 percent original, and is hard to photograph as it appears to be different colors depending on the light. I’m in love. If the Easter Bunny is listening, tell him to skip the plastic eggs and deliver this car instead. Thanks. If lilac isn’t your thing, no worries. There is an entire rainbow of soothing pastels that look fantastic on a car. We’ve even spent the past week or so looking at Subaru BRZs photoshopped in springtime hues on Jalopnik’s work Slack, and I’m still perplexed as to why one of those cheerful shades isn’t offered from the factory. Hey, automakers! It’s time for pastels to make a comeback. The world’s most perfect Porsche 930 can be found for sale here. The ad notes to contact them for pricing, however, and I suspect that purple perfection doesn’t come cheap.